This page is still a work in progress - we are waiting on the results to come in before this page can be finished. To investigate the effect of detergent on the health of plants when they are introduced in increasing amounts to the water supply. The experimental investigation will examine the effects of detergents on the health of an Elodea plant. Detergents are sometimes known as soaps, and are made of molecules that have a hydrophilic head that is attracted to water, and a hydrophobic tail that is attracted to oils and grease (see figure 1) (Taylor, 2007, p.226). This makes detergent so effective when cleaning grease off of dishes because the tail can attach to the oils and grease on the plate while the head can attach to the running water to pull the grease away. When there is enough detergent molecules separate the oils and grease, they can surround them as per figure 2, such that only the hydrophilic heads are exposed on the outside. This formation is called a Micelle (Taylor, 2007, p.234). This keeps the oils dissolved in water, and prevents the oils from clumping together again since the charges on the hydrophilic heads repel each other. Consequently, any oil, or grease material in the plant can be affected by the detergent, namely the plant cells. Plant cells have two boundaries around the cell; a cell membrane on the inside and a cell wall on the outside of the cell membrane (see figure 3). 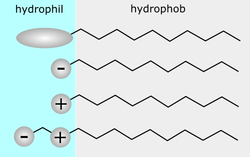 Lipids are usually two layers of molecules which have a similar structure to detergent molecules; a hydrophilic head (seen as yellow circles in figure 4), and hydrophobic tails (grey lines in figure 4). These molecules share similar characteristics to oils and grease due to their long hydrophobic tails and so are expected to be disrupted, and perhaps broken down by the introduction of detergents to the surrounding water supply of the plant. To quantify the health of the plant samples during the investigation, the plant samples will be weighed, as it is expected that as the cell membranes and cell walls become damaged, these plant cells would empty their contents into the surrounding water, making the plant lighter. In addition, the plants will be closely observed and photographed for any changes in colour to indicate changes to their health during the 7 day duration. 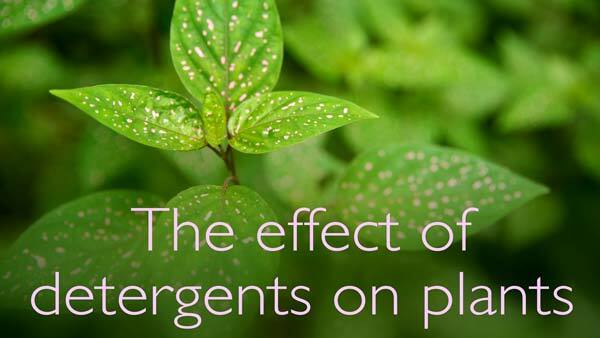 It is expected that the plants submerged in the highest concentration of detergent solution will show the fastest decline in health and weight. If the amount of detergent added to the plants' water supply is increased, then the mass of the plant will decrease and the colour of the plant will become less healthy, because the detergent will break down the lipids in the plant cells and destroy some of the plant cells. If____ (is in/decreased), then _____ (will in/decrease), because ______. 6 x 20cm lengths of the Elodea plant was weighed and recorded. The vials were numbered from 1-6, and each length was placed in each vial. The first vial was filled with 100mL of tap water using a 100mL measuring cylinder. This was then diluted with water up to the 100mL mark and stirred with a glass stirring rod to ensure the solution was mixed homogeneously. This resulting solution was used as the 1% detergent solution, and was transferred to vial 2. Steps 4-6 were repeated with 2mL, 3mL, 4mL and 5mL of detergent to create 2%, 3%, 4%, and 5% solutions and were added to vials 3-6. These vials were placed, uncovered, on a window sill to stand for 7 days. After 7 days had passed, the plants were weighed and observations were recorded. They should also be as detailed as possible such that the experiment can be replicated exactly by someone else. The aim of the investigation was to determine the effect of detergents in the water supply of plants on the health of the plant. It was hypothesised that when the concentration of detergent was increased in the water supply that the health of the plant would deteriorate resulting in decrease in mass, as well as changes in colour. The findings indicated ________, which _______ the hypothesis. Conclude whether hypothesis was supported/negated by the findings. Northeastern University 2009, 'Computational Modeling of the Intenstinal Drug Delivery Environment', Advanced Drug Delivery Research (ADDRES) Laboratory - Northeastern University, Boston, viewed 12 February 2014, <http://www1.coe.neu.edu/~rebecca/modelling_drug_delivery_enviroment.html>. Rickard, G., et al. 2011, Pearson Science 8 Student Book, Pearson Australia, Melbourne. Roland.chem 2006, Tenside haben hydrophile und hydrophobe Enden, viewed 12 February 2014, <http://en.wikipedia.org/wiki/File:TensideHyrophilHydrophob.png>. Saupe, S 2011, 'Plant Physiology - Cell Walls', Plant Physiology (Biology 327), College of St. Benedict & St. John's University, Collegeville, viewed 12 February 2014, <http://employees.csbsju.edu/ssaupe/biol327/lecture/cell-wall.htm>. Taylor, N. et al. 2007, Study On: Chemistry 1, John Wiley & Sons Australia, Milton. Zumdahl, S. S. & Zumdahl, S. A. 2000, Chemistry, 5th edn, Houghton Mifflin Company, Boston.